The wreck cause: Unknown. Round-robin Clovis NM to Denver & return. Cpl. James F. Perry of Charlotte, N.C.
Site Description:. On a SE facing slope about 800' below the top of the ridge and perhaps 200' above the creekbed. Slope is very steep with jumbles of house-sized boulders on it. 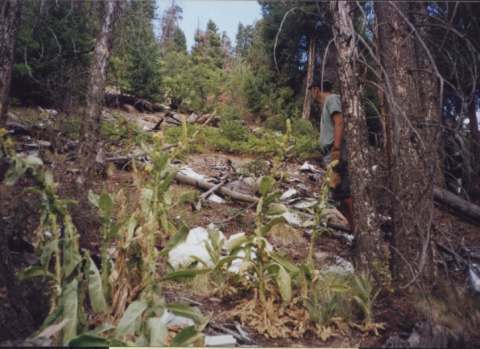 Footing is sandy decomposed granite and has some scrub oak, cactus and pines trees growing. The crash knocked down some trees and created a somewhat more open area where the craft apparently came to rest and burned. Debris at the site includes: 4 engines (2 are about 100' down the hill from the impact zone), landing gear legs, a few breadbox sized crumples of aluminum and many small melted globs of aluminum. By and large the wreckage has been removed somehow though sifting thru the impact area burn will reveal many small metallic items. Best route : Rampart Range Rd to Forest Rd 327. Go east to reach parking spot - 13S 0501299, 4336735 Study your topo map to figure out how to walk down the correct ridgetop to a point above the crash site. Would you believe it's now SEVEN tries? Ummm, I guess it's EIGHT.